The primary goal of this contribution is to analyze the influence of the double-difference (DD) ionospheric corrections latency on the instantaneous (one-epoch) ambiguity resolution (AR) in long-range RTK under typical ionospheric conditions. Instantaneous RTK is one of the most challenging topics in the contemporary precise geodetic applications (Kim and Langley, 2000); hence, a network RTK approach to instantaneous AR is currently being implemented and tested in the MPGPSTM (Multi Purpose GPS Processing Software) software. Yet, at the beginning of the session, a short initialization period (time to integer fix) is still required using network-derived atmospheric corrections. Subsequently, DD ionospheric delay correction predictions derived from the previous correctly resolved epoch were applied in order to obtain a high quality instantaneous RTK position. This method assures a successful instantaneous AR for long baselines (~100 km). Since the previous-epoch ionospheric delays are used, and instantaneous mode is applied in the algorithm, the proposed method is robust against cycle slips and gaps and still capable of producing centimeter-level RTK positions. Different DD ionospheric delay correction latencies were simulated in 10 s increments. The AR results were compared and analyzed and the performance of the RTK positioning was tested. The analyses show that about 90 s latency may exist while the instantaneous ambiguities could still be resolved correctly allowing for centimeter-level positioning. The methodology and the applied algorithms in the network RTK module of the MPGPSTM software are described in detail in Kashani et al. (2004a) and the results of this study are presented in Kashani at al. (2004b). The corrections generated using data from the CORS network include tropospheric and ionospheric delays, which may be interpolated to the rover location. The derivation of the zero difference (ZD) ionospheric delay, provided to the roving user, was done by decomposing the DD ionospheric delays obtained in the network solution. The tropospheric corrections, in the form of total zenith delays (TZD), are estimated for each reference station. The accuracy of the atmospheric corrections provided to the rover is one of the most crucial issues for successful AR in instantaneous long-range RTK. In this approach we adopted two "rules-of-thumb" concerning the ionospheric correction accuracy: first, the ionospheric correction error must be better than one quarter of the signal wavelength (±5 cm); second, the ionospheric correction constraints should follow the correction accuracy. The major problem is that the network-derived atmospheric correction accuracy may not be always sufficient and could exceed the ±5 cm limit (see also: Odijk, 2001). Short accumulation period should be applied at the beginning of the session, namely OTF technique, to initiate the system in order to overcome this problem. Once the ambiguities were resolved (fixed and validated) using the OTF technique, the instantaneous solution can be applied. In the instantaneous step, predicted ionospheric delays, more accurate than the interpolated ones, are provided to the rover solution. The predicted delays are derived from the previous correctly resolved epoch and their accuracy depends mainly on the sampling rate, their latency and the ionospheric conditions. The smaller the sampling rate and the latency, the more accurate predicted ionosphere corrections may be obtained. The predicted ionospheric corrections are robust against cycle slips as long as the same pair of stations and satellites is involved. Fig. 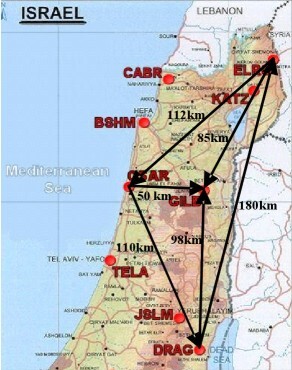 1: The GIL (GPS in Israel) network and the test area (courtesy of the Survey of Israel). Analysis of the rover positioning performance in the instantaneous mode. It should be mentioned that medium-scale ionospheric disturbances occured during the first session. These disturbances may have an impact on the ionospheric correction accuracy. The AR performance was analyzed as the percentage of the correctly resolved and validated ambiguities within each session. The AR depends on the accuracy of the ionospheric corrections provided to the rover (rule 1) and the ionospheric constraints applied in the generalized least squares (GLS) adjustment stochastic model (rule 2). The constraints applied to the DD ionospheric corrections were proportional to the correction latency: the larger the latency the less tight the constraint (e.g., 1 cm for 10 s latency and 5 cm for 90 s). Table 1 presents selected examples of the AR performance as a function of the DD ionospheric correction latency and the baseline length, obtained from the single-baseline solution. The applied methodology allowed for 100 percent instantaneous AR success in all the sessions when the latencies were up to 80 s, and between 95.8 and 100.0 percent, when they reached 90 s. The worst results were obtained during the first session, characterized by higher TEC gradients just before the sunrise, when the ambiguities were not correctly fixed in some epochs and baselines. As expected, better results were obtained for the sorter baseline (50 km) with only one session with few unresolved ambiguities. However, all the ambiguities may be resolved instantaneously when the optional multi-baseline solution is applied, as is demonstrated in Kashani et al. (2004b). Tab. 1: Example AR success rate (%) for all analyzed sessions, for 50 km and 98 km baselines. The results of a 98 km long single-baseline (GILB-DRAG) processing are presented in Figure 2. Different latencies of the DD ionospheric corrections were tested with 10 s increments and example results for 90 s latency are shown for the mid-day session. The results presented here confirm that the instantaneous long-range RTK methodology and algorithms applied in the MPGPSTM software can process 100 km baselines even with DD correction latency of 90 s (depending on the local ionospheric conditions). The interpolated ionospheric correction accuracy may not sufficient to assure a high success rate of instantaneous AR. Thus, after a short initialization period, the DD ionospheric delays from the previous correctly resolved epoch were used as a prediction for the current epoch. For the existing ionospheric conditions, network configuration and the processed baseline lengths (50 and 98 km), 90 s latency seems to be a limit for reliable instantaneous AR. Once the ambiguities are correctly resolved, centimeter-level instantaneous RTK positioning is assured even for ~100 km long baselines. Slight mismodeling of tropospheric correction affects the height component quality. However, centimeter-level accuracy is still feasible. The optional multi-baseline approach applied in the MPGPSTM software improves the solution in terms of the AR reliability and positioning quality. It should be noted that the analyses were performed in the post-processing mode. The algorithm, however, is suitable for real-time applications as well. Naturally, for the real RTK implementation, the issue of communication and the computing power at the rover station must be addressed properly.